Australia latched on to this appeal for desi tourists when it launched a major campaign last month to attract more travellers from here Down Under. “India and Australia have similar basic road rules. Both nations drive on the left hand side of the road, and the cars are of right hand drive variety, making it easier for Indians to plan a self-drive holiday in Australia. In most Australian states and territories except Northern Territory, you are able to drive on an overseas licence as long as it is current, and in English. You can drive vehicles which your overseas licence authorises you to drive,” said Nishant Kashikar, Tourism Australia’s country manager (India & Gulf). Debolin Sen of travel major Cox & Kings said Indian travellers are becoming more adventurous and look for immersive travel experiences like a selfdrive holiday. As a result, specialised tour operators with end-to-end solutions (like Self Drive 365) are coming up and many international tourism boards are making concerted efforts to market self-drive as a separate product. 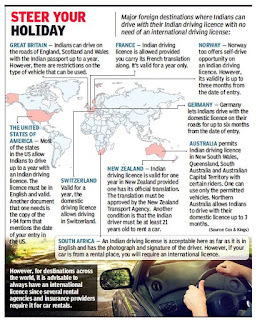 Asked in which all major foreign destinations can Indians drive with their desi licence, Cox & Kings gave a long list. “Most states in USA allow Indians to drive up to a year with an Indian driving license. The license must be in English and valid. Another document that one needs is the copy of the I-94 form that mentions the date of your entry in the US,” it said. “Indian driving licence is allowed in France provided you carry its French translation along. It's valid for a year only. 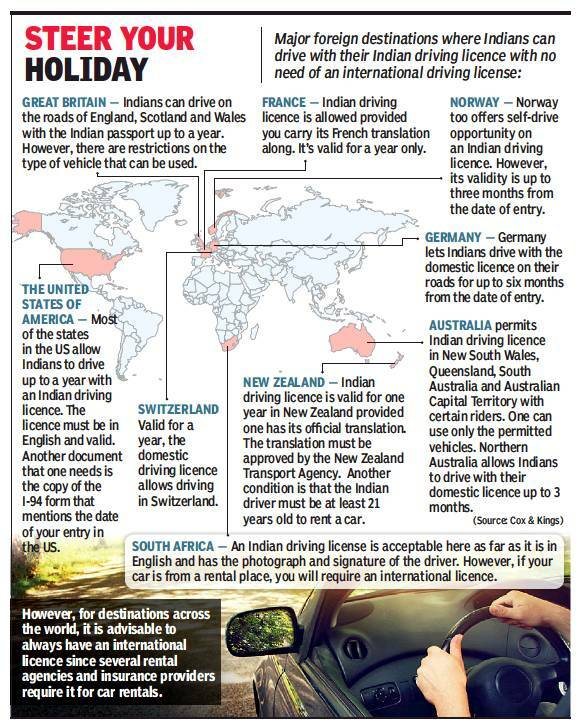 Indians can drive on the roads of England, Scotland and Wales with the Indian passport up to a year. However, there are restrictions on the type of vehicle that can be used. Norway also offers self-drive opportunity on an Indian driving licence for up to three months from the date of entry,” the travel major said. Germany lets Indians drive with the domestic license on their roads for up to six months from the date of entry. In South Africa, Indian driving license is acceptable if it is in English and has the photograph and signature of the driver.